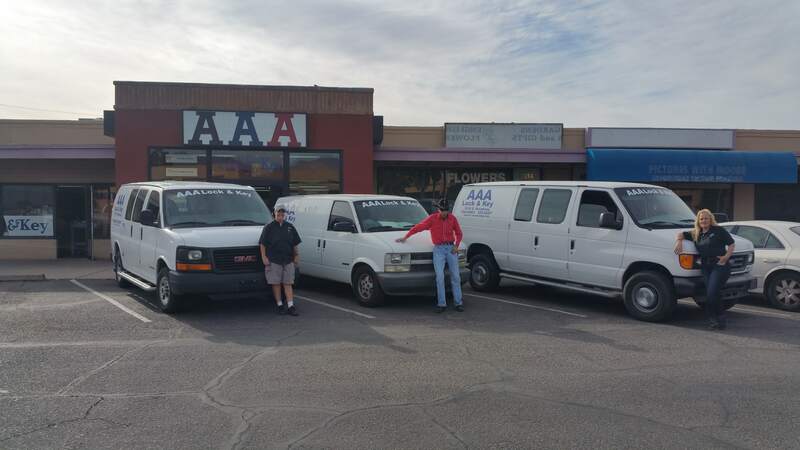 For the very best mobile locksmith in Tucson, think AAA Lock & Key. For over 55 years, we’ve been providing excellent lock and key service to our valued customers, and we hope to add you to our list. Our locksmith services run the gamut and we’re always on hand to help you in your time of need. Whether it’s your home, car or office, being locked out of the place you need to be can be one of the most stressful experiences daily life can offer—not to mention an unsafe experience depending on the time of day or location of the lockout. Don’t let a slow, unreliable locksmith add to the stress: choose AAA Lock & Key! We provide the fastest, most dependable and friendliest service for any emergency lockout in Tucson. Our expert locksmiths are here to meet your needs and make your lock emergency a little less trying. We are a mobile locksmith that will come to your location. We have the friendliest, fastest and most dependable locksmiths in Tucson. We’re your valued source for safe and vault sales and installation. We’re licensed and insured by the Associated Locksmiths of America, and have been serving Tucson since 1959. Our rates are affordable and our service is prompt. For the best in lock and key service, there is no better name in the business than AAA Lock & Key. For all emergency and non-emergency lock needs you may have, give us a call!